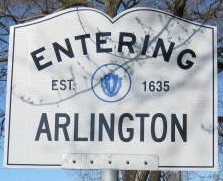 Go to http://arlingtonlist.org/listinfo/arlington and scroll down to the bottom of the page. In the text box at the bottom, enter the e-mail address under which you subscribed, and press the "unsubscribe or edit options" button. On the page that appears next, find the section called "Password reminder" and press "Remind"
You password will be emailed to you at that address.